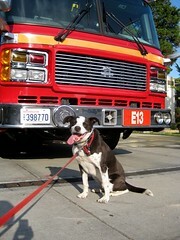 Joel Lee's happy dog recently posed in front of the Beacon Hill Fire Station. Photo by Joel in the Beacon Hill Blog photo pool on Flickr. The Seattle City Council is bringing a town-hall meeting to Southeast Seattle, from 6:30 – 8:30pm on Tuesday, September 22. The public are invited to attend this event, where Councilmembers will ask for feedback on light rail, crime and city services while also taking your questions. Questions at the event may be written or asked live on the microphone, or submitted in advance to counciltownhall@seattle.gov. The meeting will be at the Rainier Vista Boys and Girls Club located at 4520 Martin Luther King Jr. Way South, just a couple of blocks north of the Columbia City Link light rail station. For information or questions, call 206-684-8805. Accommodations for a disability or translation services can be made in advance by calling Nancy Roberts at 206-684-8146. After an August break, the North Beacon Hill Council will be meeting again this month. The meeting date is Thursday, September 10, at Beacon Lutheran Church, across the street from the library at 1720 South Forest Street.